Dovetales Separation and Divorce Series...Where Do I Go From Here? 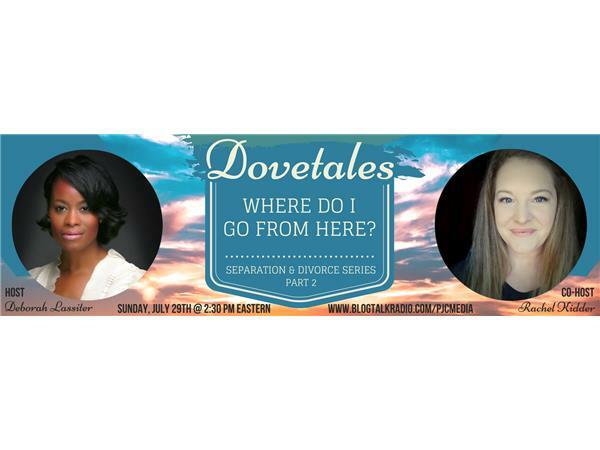 Dovetales is back for our second broadcast in our Separation and Divorce Series. Our first program focused on the reasons "why" one said "I DO." This time we will focus on the horrible pain and agony called the "limbo stage," meaning, the moment one questions if their spouse will ever come back or just call it quits. What does one do and "Where Does One Go From Here?" If you have ever been Separated or Divorced join us by calling into the show and sharing what choices you've made and what you've learned --good OR bad. We are all here to #learn, #listen, and #growwhile being led by the One who leads all men to truth--the Holy Spirit! Looking forward to another great discussion. You are not alone my friends, for pain surely has a way of bringing the most diverse groups of people together. To weigh in on our topic call 646-668-8485 press 1 to be live on the air. Download the stitcher app on your mobile device. Or, click on link here.